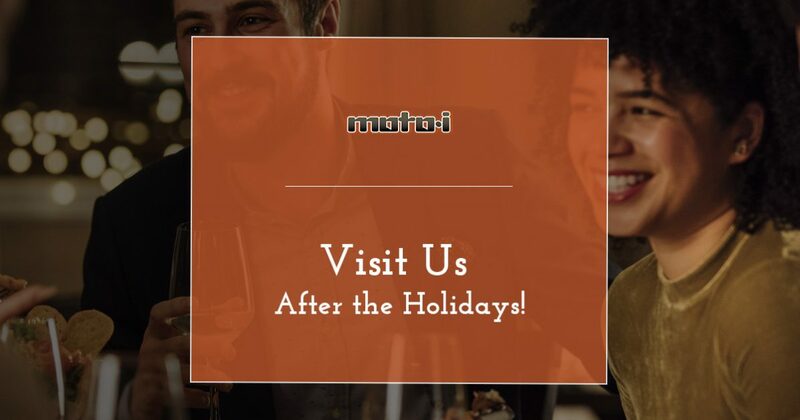 At moto-i in Minneapolis, we know just how hectic the holidays can get. You have people visiting nearly every day of the week, and you’re making meals, desserts, and more in the kitchen all the time. Once the holidays are over, you’re likely looking to relax for a few days and decompress following all the hubbub. At our Japanese restaurant, you can find a casual atmosphere and great food, which can be the perfect remedy following a busy holiday season. You might see a lot of your spouse or significant other during the holidays, but it’s rarely just you and them. You’re always in a room full of people, or you’re driving to a friend or relative’s house for another holiday party, which doesn’t really count as quality time. Once the craziness has subsided, it can be good to get away for a quiet date night at a nice restaurant. Perhaps you haven’t had a chance to exchange gifts yet, and date night can be a great time to do that. The holiday season can also be stressful, as you try to make sure that you have everything in order and that you’ve bought a gift for everyone on your list. You have to be around family as well, which can bring about its own kind of stress. You look forward to seeing everyone after a year’s time, but once it’s over, all you want to do is be by yourself, or perhaps with just your immediate family. When you visit our restaurant, you can sit down, order your favorite ramen dish or appetizer, and decompress for an hour or so. Our staff will do everything they can to make sure your visit is enjoyable and stress-free. The house may be a mess following the holidays, with gift paper still strewn about, and presents still not put away in dressers, closets, and cupboards. After you spend a few hours cleaning and organizing, reward yourself with a night out on the town. You don’t have to go to multiple places, but you can hit your favorite bar or restaurant and enjoy a drink or meal that you didn’t have to make yourself. There will be no dishes to clean up and put away, and you can go home full and satisfied. You love spending time with the kids during the holidays, and you enjoy making memories with them that will last a lifetime. However, if you want to go out on the town, it can be tough to bring the kids with you. By hiring a babysitter, you can have someone watch the kids while you and your spouse enjoy a night out. You may also have relatives who are willing to watch the kids, and while you’re out on the town, your kids will be having a great time with Grandma and Grandpa, or an aunt or uncle whom they don’t see very often. If you’re looking for ways to de-stress and unwind after the holidays, visit our Japanese restaurant in Minneapolis. We promise that you’ll have a great time, with amazing food and sake that’s brewed on-site.